With great mileage and fuel efficiency this is a popular model for vacationers and business trip attendees who want some style with their freedom. 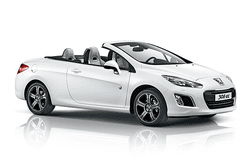 The Peugeot 308cc Auto has all the great features of the standard mode with the additional benefits of a drop top. This model is sleek and stylish while also offering great control and speed with a powerful engine that fits into a small yet charming package. Wherever you are going and whoever you are taking with you, the way to go in comfort and style is in the Peugeot 308cc. Check it out today for yourself by booking the Peugeot 308 cc today and see the difference yourself!